Think tacos meet spaghetti, but healthier! 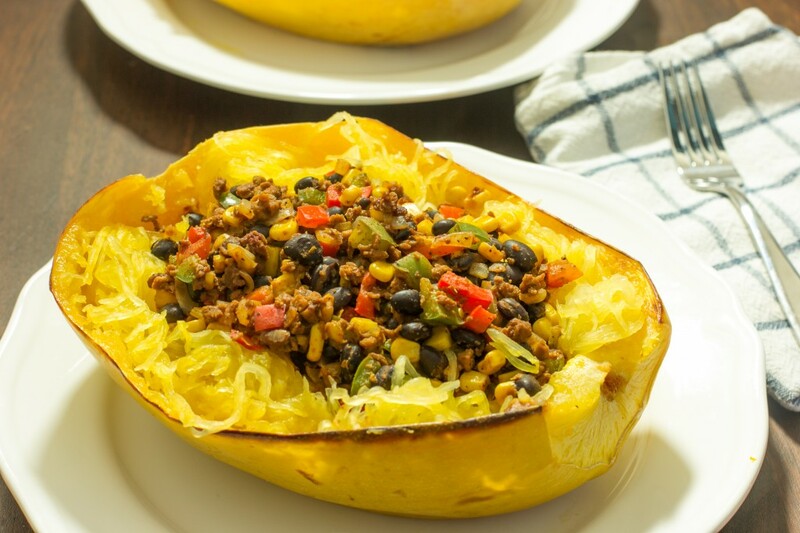 With fewer carbs than traditional pasta, spaghetti squash is a filling and satisfying meal that tastes great when accompanied with southwestern stuffing. Top with vegan or dairy cheese and some freshly chopped cilantro and serve. 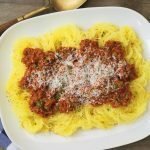 It takes about an hour to cook and assemble and is a great way to take advantage of the abundance of seasonal spaghetti squash in the fall. Slice off the top of the spaghetti squash to create a flat surface. Turn the squash upside down and stabilize on the flat surface. Cut the squash in half, rocking the knife back and forth from the top down to cut. Scoop out the seeds and reserve for roasting later as a tasty snack. Brush 1 tbsp olive oil on the cut sides of the squash and place facedown on a lined baking sheet. Bake for 35-45 minutes until tender. Sauté onions over medium heat in olive oil until translucent. Add red and green onions and cook until tender-crisp. If you’re adding jalapeño, add it now. Add ground veggie meat, chili powder and cumin, and cook until heated through. Add corn and black beans and cook until all ingredients are evenly incorporated and heated. Remove cooked squash from the oven and use a fork to gently scrape out the strands of spaghetti squash and transfer to a bowl. Use the hollowed spaghetti squash as a bowl and arrange spaghetti squash strands around the edges of the squash halves. Fill with the stuffing, and top with a squeeze of lime juice and if desired, cover with vegan or dairy cheese. Broil until melted, then top with freshly chopped cilantro. 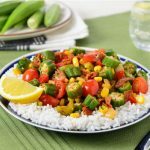 This recipe is created by Lisa Le, the Toronto-based vegan food blogger behind Je suis alimentageuse. She blogs about food with stories about Vietnamese culture, nerdism, feminism, and her life sprinkled in on top.